You mean so called "native ISO"? @Vitaliy_Kiselev exactly. From their description I understand they are gonna have a “dual ISO” similar to professional Panasonic cameras. I used it in Panasonic Varicam and it’s amazing. You reference GH5s, do you think this cameras have identical sensor? @Ironfilm seriously, the hard disk price. My 512gb SD cards are expensive, and they aren't even CFAST or whatever. There's probably even a housing somewhere that you can put a regular drive into. If it really works, the port is a game changer, price wise. I even found this online, don't know if it works with the camera. I imagine for people trying to shoot with 4K on the BMPCC4K with an ultra frugal budget, that their shooting style will have a lot of similarities to the way RED ONE folks shoot (for those who don't have the SSD module, or only have a limited number of gigs on it). At least until CFast prices fall further. What they'll do is for the tripod shots they'll use their USB-C (just like RED ONEs using their RED-DRIVE for tripod shots) but then switch over to using their CFast card when handheld (again, just like how RED ONE owners would then switch over to CF or SSD when then going handheld). At least until CFast prices fall further. You don't need to wait. As I said, cheap USB-C to M2 SSD drives cases exist, check aliexpress. My point is USB-C won't be for everyone, many people would prefer internal media. 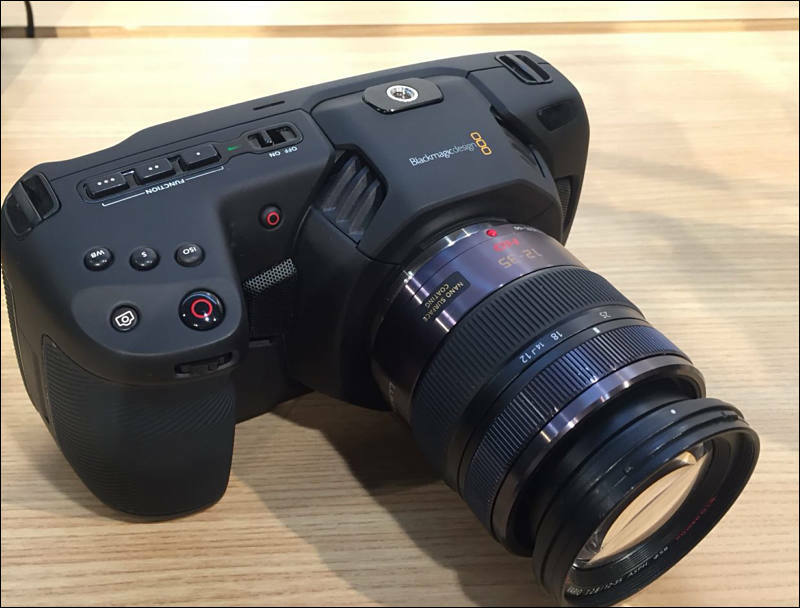 Thus I could imagine people shooting with the BMPCC4K in a similar shooting style as RED ONE owners have used (with a mix of RED-DRIVE vs CF/SSD), which I've observed a lot of. Ugly and beautiful at the same time. Don't know why people think that this camera is ugly. This camera is beautiful looks like a DSLR.. I think that the picture someone posted a page or two ago saying it looks like a V-Tech "my first camera" is pretty much right. Same, I don't get where the hell these avalanche of "ugly" comments come from! Looks great to me. Design has certain rules to make product look harmonic. This one looks like monster conceived in kitchen full of blood. Yep, looks OK to me as well. Not a beauty but not much worse than, say, a GH5. I guess people still associate with it the fake picture of the camera that showed up a day before the official announcement. It was horrible and disgusting indeed. I don't look at my camera much, but it looks like a vacuum cleaner. Anyway, I want one. The datarates are very high, needs lots of expensive memory cards and computer disk space, the workflow can be slow due to raw conversion. Does it worth the effort? I can get a very nice 4k image from the G7, with grading and correct denoise it looks like cinema picture, it records 110 ire so I can recover some amount of highlights in post and lift shadows a little bit, so I don't know if the benefits of BMPCC4k would worth money and effort. People are always really excited about raw and it gets a lot of the press, but I'm more excited about ProRes - especially if it turns out that ProRes can record to a standard SD card vs CFast. It's nice to have the option for raw, though, if a situation calls for it. Hi, have you found any informations about the "still" option? resolution? @apefos The G7 is a nice camera (I have 4, oops, sold one, 3) but the G85 is even nicer. If you see a deal on one jump on it. I don't mind the design. I may even like it some, the camera looks very usable handheld with or without support, and we have to wait and see how well balanced it will be, I suppose it depends on the weight of this new material, as well as the lens used.